It took a thousand years for the world’s economic centre of gravity to shift from Asia to Europe. A thousand years ago, the economic centre of the world was in central Asia, just north of India and west of China, reflecting the high levels of wealth enjoyed in the Middle and Far East at that time, says the report, Urban world: Cities and the rise of the consuming class. At that time, Asia accounted for two-thirds of the world’s wealth. By 1900, the centre had shifted to northern Europe, which had leapt far ahead of the rest of the world thanks to the Industrial Revolution. And by 1950, the centre had shifted to the North Atlantic, reflecting the economic rise of the United States. But now that trend is reversing itself, and at a stunning speed. What took 1,000 years to travel west will have travelled all the way back east in a matter of a few decades. 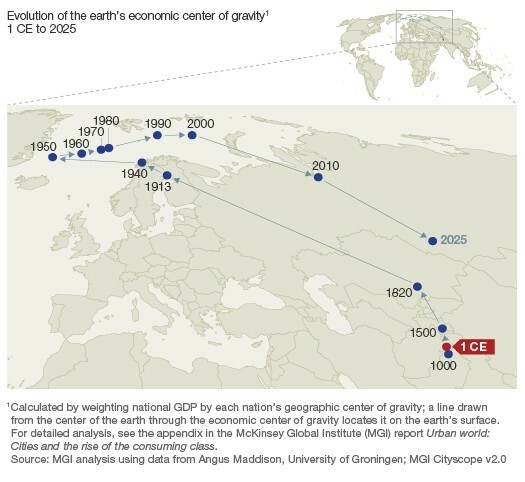 According to the McKinsey report, the economic centre of gravity has been shifting east for the past decade at a rate of 140 km (87 miles) per year, and by 2025, it will have returned to a spot in central Asia just north of where it was in 1,000 A.D.
“It is not hyperbole to say we are observing the most significant shift in the earth’s economic centre of gravity in history,” the report concludes. The report links the major shift in the global economy to the trend of urbanization, noting that rapidly growing economies always have rapidly growing cities. By 2025, the report predicts, two-thirds of the world’s economic growth will come from a group of 600 cities -- 440 of them in developing countries. Urbanization today is like nothing the world has ever seen. According to the report, China’s urban growth is taking place 10 times as fast as urbanization did in the U.K., the first country to industrialize. China is creating megacities (population 10 million or more) at a rate of one per year, the report states. “We expect to see one billion more people in cities worldwide become members of the consuming classes, with enough income to buy the very basic necessities and to have some discretionary income to spend on consumer goods and services,” the report says. And while that provides enormous opportunities for companies willing to move into those markets, the report notes it will also mean cities will have to invest heavily in infrastructure to keep up. The world’s major urban centres will need $20 trillion of investment into physical capital by 2025, up from $10 trillion today.  But the report notes that this trend will eventually end, and cities will not be able to rely on population growth forever for their wealth. “After most people have already moved to urban regions, cities will need to find new sources of productivity gains and economic growth,” the report states.